Buffalo-based independent comic publisher Zombie Ink Comics is proud to announce that they will be releasing Wolff’s Run written by MonsterMatt Patterson (MonsterMatt’s Bad Monster Jokes Vol. 1) and illustrated by tattoo-artist Bob Bieber. Zombie Ink is shooting for a mid-2011 release for the three issue mini-series. 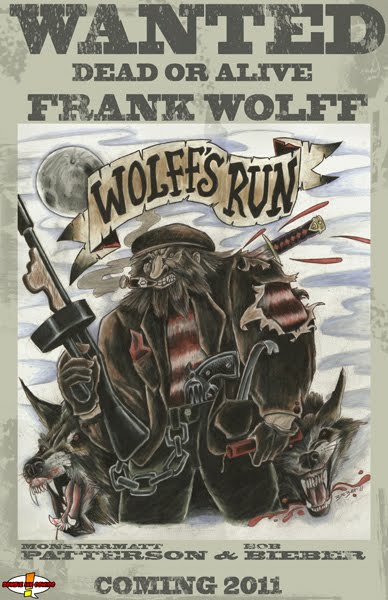 Combining equal parts horror, sci-fi, and crime noir set in the Prohibition Era, Wolff’s Run promises to be a dark hard-boiled romp full of surprises! The story follows Frank Wolff, an illegal immigrant smuggler and rum runner on the Canadian border who crosses the wrong people and finds himself the subject of a twisted experiment! Wolff’s Run fits in perfectly with Zombie Ink Comics’ brand of underground pulp comics.